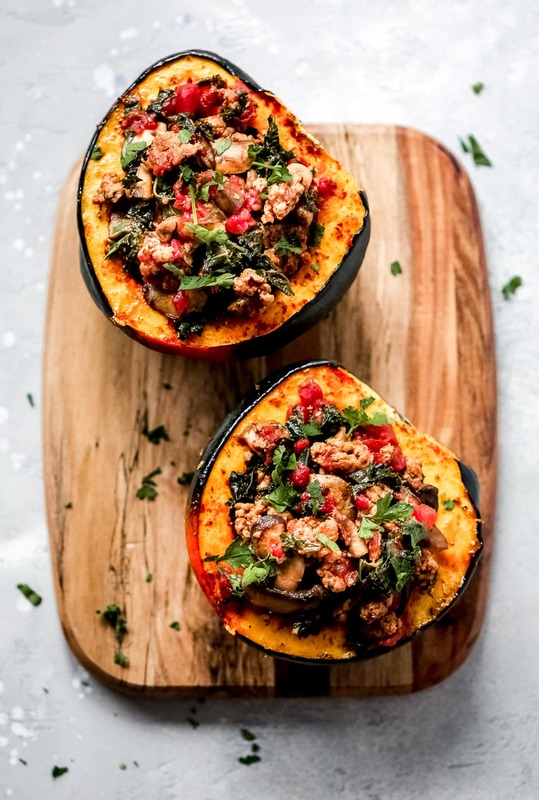 This Sausage and Kale Stuffed Acorn Squash is a feel-good meal that will boost your mood and warm you up during the cold fall and winter days. Since I made my Easy Roasted Acorn Squash recipe last week, I can’t stop eating this yummy squash. Oh my God. It is now my favourite fall veggie. 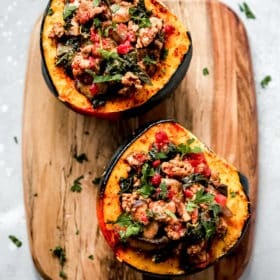 So, today you’ll be amazed by this Sausage and Kale Stuffed Acorn Squash recipe too because this is so delicious that will become your favorite for fall and winter dinners. This recipe is not only hearty and satisfying, but healthy too. 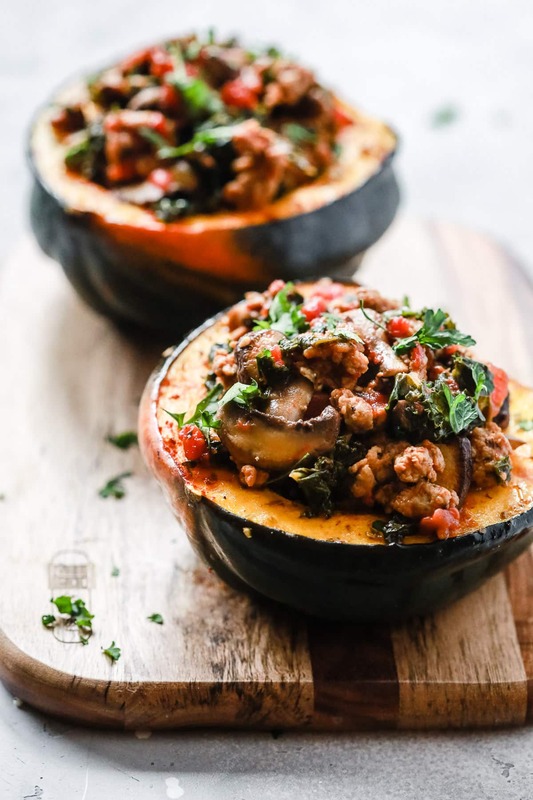 You probably know but acorn squash is loaded with vitamin C, which is a great vitamin to help to boost your mood during the cold weather. Sometimes, many of us experience a mood shift during the colder, darker days of winter. But one of the ways to beat the winter blues is to eat tons of healthy food that contains lots of vitamin C like acorn squash. So, this is one more reason to make this recipe now, friends! 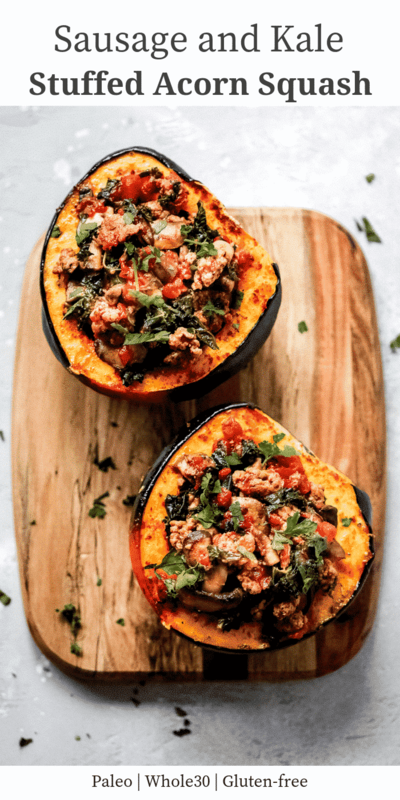 This Sausage and Kale Stuffed Acorn Squash recipe is very easy to make. It’s so simple that I feel sort of guilty even calling this a recipe…hahahahha! But when I made it, it turned out so delicious that I thought I should share with you, my readers. Bake the squash in the oven for about 50 to 60 minutes. 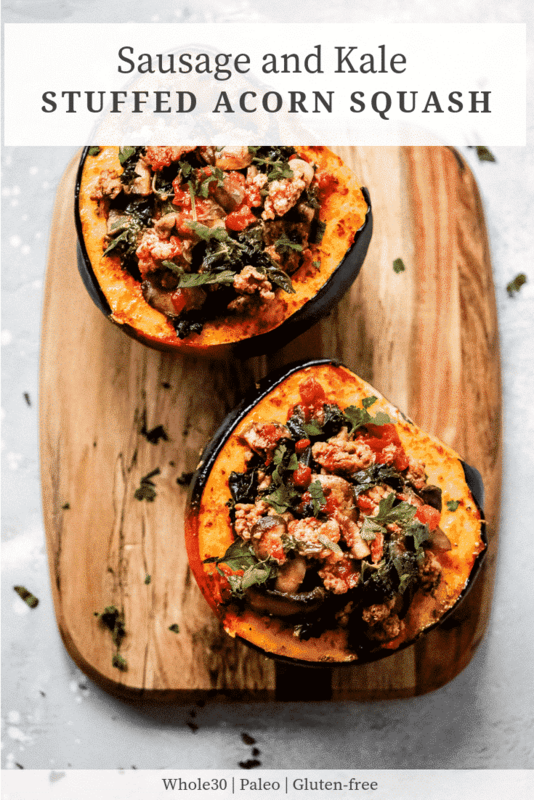 While the acorn squash is in the oven, prepare the filling by cooking the sausage and then sauté onions, garlic, mushroom, kale and tomato sauce in the skillet. Then, when the acorn squash is baked, remove from the oven and stuff the baked squash with the filling you just prepared. 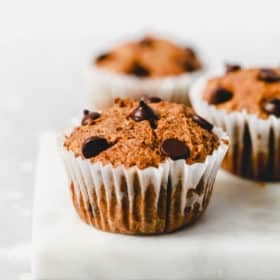 For more detail about how to make this recipe, visit the recipe carb below. You can stuff the acorn squash with a number of things. If sausage is not your thing, you can replace it for cubed chicken breast, shrimp, tofu or any other type of protein you prefer. Or you can also make a vegetarian version of this dish by replacing sausage for rice or quinoa. This sausage and kale stuffing can really be used to fill any type of winter squash. It goes really well with butternut squash or sweet potato too. After you bake the acorn squash, its skin becomes so thin that you can actually eat it. Awesome, right? Pour olive oil over the acorn squash and sprinkle with paprika, salt and pepper. Bake in over for 50-60 minutes, until skin is soft and fork-tender. While squash is cooking, heat 1 tablespoon olive oil in a skillet over medium-high heat. Add sausage and using a wood spoon break into coarse pieces. Cook until brown. It’s about 5-6 minutes. Then, set it aside. In the same skillet, add remaining 1 tablespoon oil and onions; cook until they’re soft, 3 minutes. Add garlic and cook for 30 seconds. Add mushroom and cook for 3 to 5 minutes. Stir occasionally. Add kale and toss; add tomato sauce and cover the skillet with a lid and cook until kale is tender. Bring back the sausage and stir well to combine. 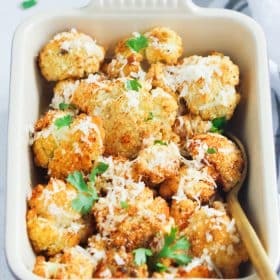 Top with Parmesan if you desire before serving. Enjoy!